If you walk from the Panaji Secretariat along the Mandovi river, you will come across a rather strange and haunting statue in the middle of the square near the bus stop. While most locals ignore the statue, while sitting at the square or waiting for the bus, for some reason, I couldn’t take my eyes off this strange yet haunting statue. And as dusk began to fall, it gathered an even more haunting, even evil feel to it. When I returned back to my Heritage Suite at my Mitaroy Heritage Homestay, I immediately got on the internet and did some research. 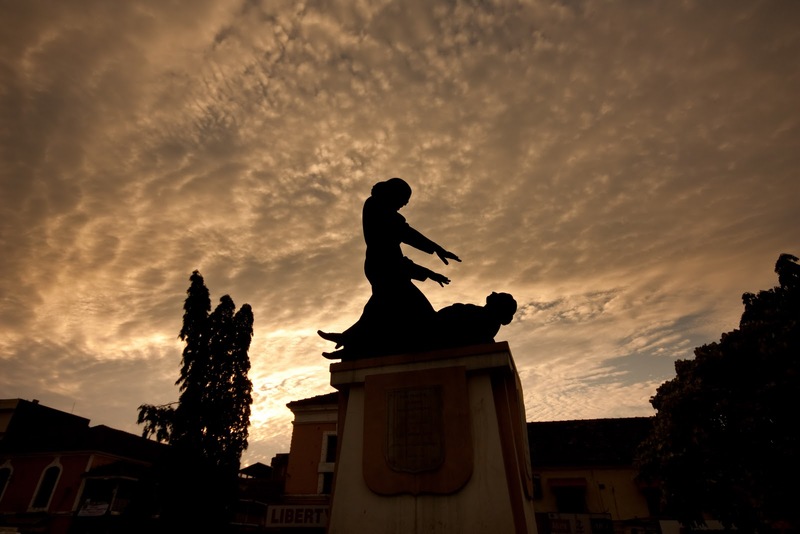 The statue in question was of a priest standing tall over a woman who was lying down. The priests hands are outstretched towards the woman and the woman seems to be responding to whatever effect the man is having on her. The priest in question is Abbe Faria (Abbe meaning priest in French). Abbe Faria is claimed to be the founder of the hypnotic sciences, even though imaginably, it wasn’t very popular in those days, hypnotism being usually connected with evil spirits and black magic. It is even conceivable that Abbe Faria might have even burned alive as a witch, if he had been a woman or had not been a priest. Jose Custodia Faria was born to Rosa Maria de Sousa of Candolim and Caetano Vitorino Faira of Colvale. Born on May 31st, 1756 in the village of Candolim in Bardez Taluka or district, Faria spent most of his life outside Goa, dying finally in Paris on September 20, 1819. His parent’s marriage was not a happy one and they often thought of separating. Caetano Faria, Abbe Faria’s father, had been studying to be a priest when he fell in love with Abbe Faria’s mother, Rosa Maria, who had been studying to be a nun. After they separated, Caetano Faria completed his priestly studies and Rosa Maria went off to the convent to become a nun, later becoming the Superior (Prioresa) of the Santa Monica Convent. Abbe Faria was taken by his father to Lisboa (Lisbon) in 1771. They landed in Lisboa on November 23, 1771. The reigning Monarch at the time, Dom Jose I gave permission for Abbe Faria to go study in Rome to become a priest. Abbe Faria was ordained a priest in Rome on March 12, 1789. After his ordination, he went to Portugal but soon returned back to Paris where he got himself involved in politics. It was here that he began his sessions on magnetism and hypnotism, in one of the halls of Butel de Sarti’s school at 49, Rue de Clichy. The sessions were held every Thursday with an admission fee of five francs. Abbe Faria seemed to attract more women than men, who came either in the hope of finding a cure to their ailments or simply for the thrill.